The National Space-Based Positioning, Navigation, and Timing (PNT) Advisory Board kicked off a two-day meeting in Redondo Beach, California this morning with James J. Miller, Executive Director, PNT Advisory Board, NASA Headquarters; John Stenbit, Chair, and Dr. Bradford Parkinson, 1st Vice-Chair, among those speaking at the opening of the sessions. 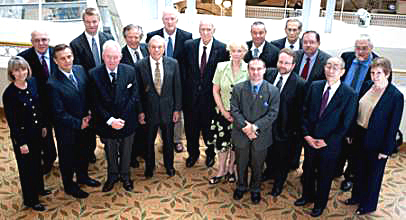 The PNT Advisory Board, which provides independent advice to the U.S. government on GPS-related policy, planning, program management, and funding profiles in relation to the current state of national and international satellite navigation services, holds its 22nd meeting today and tomorrow at the Crowne Plaza Redondo Beach. Today’s program features sessions on GPS Program Status & Modernization Milestones; PNT Efforts by the Department of Homeland Security (DHS) National Risk Management Center; Real-World Receiver Testing and the 1dB Criteria Impacts; Securing GPS-based Systems against Signal-in-Space Threats; European Efforts to Protect, Toughen and Augment GNSS; Alternative PNT in Europe; U.S. Department of State (DOS) Report; and 2nd Generation Satellite-Based Augmentation Systems (SBAS), Capabilities & Issues, and more. Thursday’s lineup includes sessions on Mission Countdown for Deep Space Atomic Clock (DSAC); The Evolution of Spoofing; Evolution of Precise Positioning from Specialty to Mass Markets: Recent Developments & Future Prospects; a Roundtable Discussion, and more.